While a 10th place in the first race finally put a blemish on the score line of Vladimir Prosikhin's Team Nika, the Russian team subsequently posted a consistent 2-2. As a result they continue to lead this third event in the 2016 RC44 Championship. But demonstrating how close the RC44 fleet is at this stage of their season, across the six races sailed so far, there have been six different winners. And even a boat which to date hasn't scored a race win at the RC44 Portsmouth Cup, or indeed a second, was today's second top scoring boat. 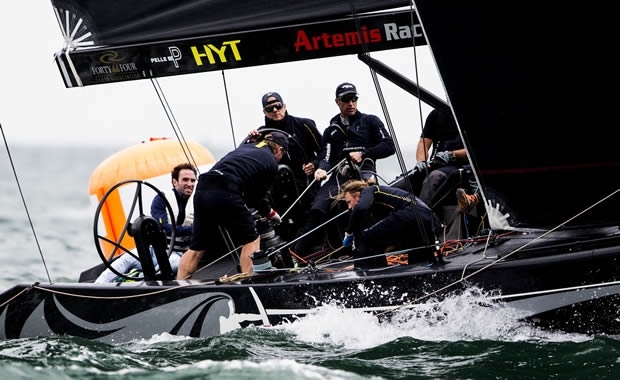 Artemis Racing Youth, skippered by Gustaf Lidvall and with a number of young Swedish sailors on board, had its best ever day racing RC44s. As Lidvall recounted: "We had two really good starts and another where we were over early, but we saved that by turning back before the gun. We did very well on the first beats. We were in phase with the wind shifts, had clear lanes and stayed out of traffic. We've had a couple of fours and fives before, but this is the best day we've ever had." Part of Artemis Racing Youth's secret lies in their tactician, three time Olympic medallist and winner of the Star gold at London 2012, Freddy Lööf. What went right? "It was a case of what didn't go wrong!" explained Lööf. "We just tried to sail consistently. Now we are beginning to have good boat speed. The crew is working well and is starting slowly to get familiar with the boat, me included. It was nice to have our work finally pay off." The strongest performance of the day was Team Aqua of RC44 Portsmouth Cup host, Chris Bake, which won today's final race, after a 2-8. Bake was pleased: "It was a tricky race course, but once we'd figured it out - the boat was going well, the team was working well together and I am quite optimistic. I am looking forward to the next two days." Team Aqua's Kiwi tactician Cameron Appleton said that today's success had come because in such a competitive fleet it has been necessary for the team to look closely at the minutiae of their racing. "I think we executed quite well today. The middle race was our worst race and in that we led around the top mark but then slide backwards, which shows you how deep and strong the fleet is. The depth is unbelievable. Everyone is sailing well and it's hard to be consistent. We had great starts, the guys did a great job of handling the boat and Chris did phenomenally well steering the boat." Katusha also had a good day, claiming today's opening race. For this regatta, co-owner with Alexander Novoselov, Vladimir Sokolov is steering. As to how they turned on the afterburners today, Sokolov reckoned: "It is all thanks to the team which is performing extremely well. Everything is well organised – it is great conditions and that's why we are doing quite well." Sokolov's crew won the first race after claiming the pin end at the start in a big right shift, and then after a long haul out to the left, perfectly picked up a reciprocal shift on which they tacked. This had them launched. Their second race didn't go so well, as American tactician Andy Horton observed: "We got pinned by a couple of people out on the left. We went from first to last." As to the conditions today, Horton said that they were easier tactically. "Yesterday there was this offshore gradient a little more to the right due to the wind fighting the thermal breeze. Today it was all a little further left and wasn't so shifty. Today was more about boat speed, good starts and normal things. It was shifting 15-20° whereas yesterday we had 60° shifts." Torbjörn Törnqvist's Artemis Racing was today's third winner, but sandwiched this between two deep results. Three more races are scheduled for the penultimate day of the RC44 Portsmouth Cup tomorrow.